A new Kickstarter update - number 65 - has just been released, and it is full of enticing snippets of footage! It is the second Development Room Progress Report update, sub-headed "The Game Designers", following the first one that was seen back in Update #59 in August. 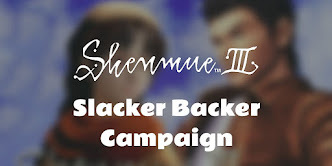 Now it has been a while since the the last official update (at Christmas, or the New Year counting the New Year's Greeting posted only on the Shenmue.link site), but it has been pleasing to see that we fans generally coped patiently with the wait, understanding that the dev team has been knuckling down and pouring their efforts into the game development. The dates on the "Loading" screens range from February 22nd through to February 27th, so based on these dates we are being shown very recent footage. 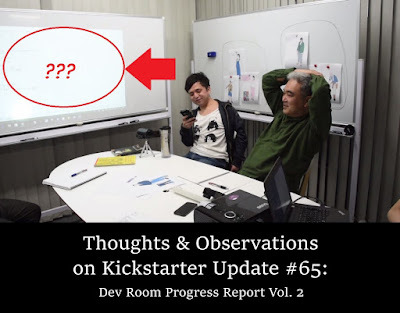 And we are treated to some tantalizing glimpses of those efforts in this latest Development Room Progress Report video update. I was able to translate a few of the words on the screen in the Dialogue Meeting (section 3), which might be considered minor spoilers so I have hidden them behind a Spoiler button for those who don't wish to learn too much! 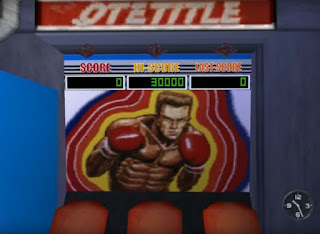 In the previous Development Report we saw direct evidence of Quick Timer Events returning in Shenmue III, but here we see them return inside an arcade game that looks and sounds very similar to the good old "Excite QTE 2" machine from the original Shenmue games. One obvious change is that the button prompts that pop up on the screen use the PlayStation symbols. A pair of neon tubes runs down each side of the monitor, similarly to the way they did on the Excite QTE 2 machine. A close-up of the arcade monitor shows great texture detail, in the fading and discoloration of the neon tubes, the dents and scratches and even the way the letters and numbers reflect up onto the black surround. I love the way even the graphics on the arcade screen are given black scan lines and fuzziness, to emulate how they would appear on an old CRT monitor. 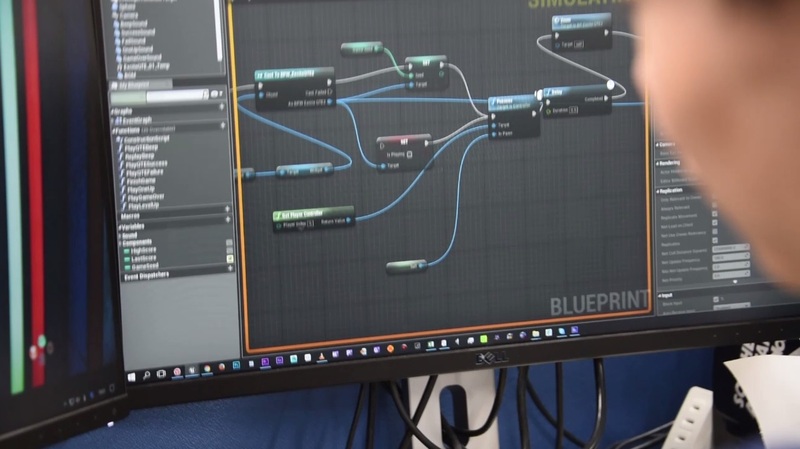 The second monitor shows Blueprint Visual Scripting (the scripting environment used in Unreal Engine) running the ExciteQTE game under "Simulate in Editor" mode which is useful for gameplay testing since changes can be tested on the fly. 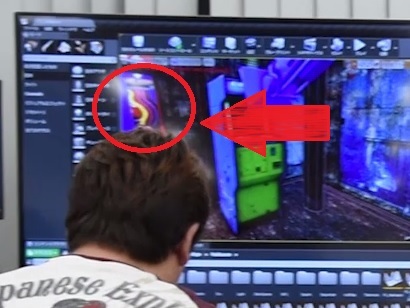 After the main title, we see a monitor showing what appears to be a couple of short movie clips. There is a short clip of Ryo entering a room in a house that is in disarray, then stooping to push a toppled table out of the way. This looks to be a continuation of a scene that is shown at a later point in the video, but it is of note that the clip appears with inside an oval frame that fades out to white, as if the scene is being recalled at a later time. 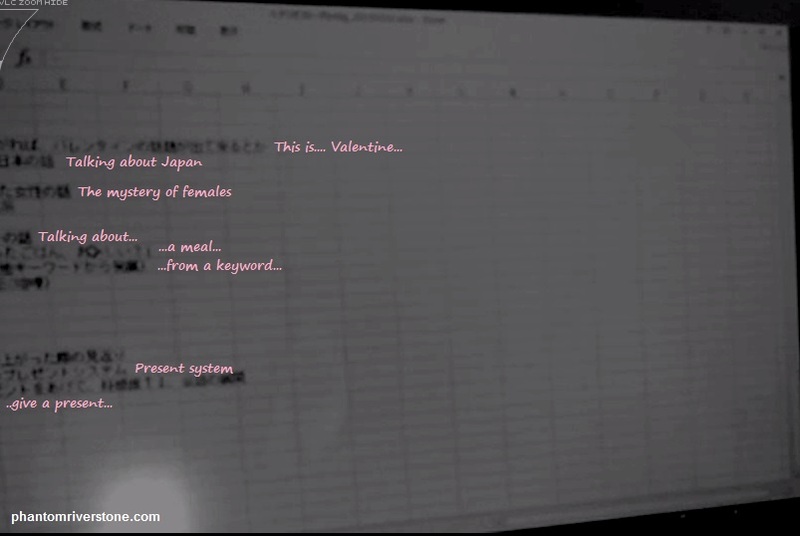 The second clip shows a page of a spiral-bound notebook turning, instantly recalling Ryo's notebook in the original games. A few words are written on the page but the camera (most likely deliberately) does not put them in focus. 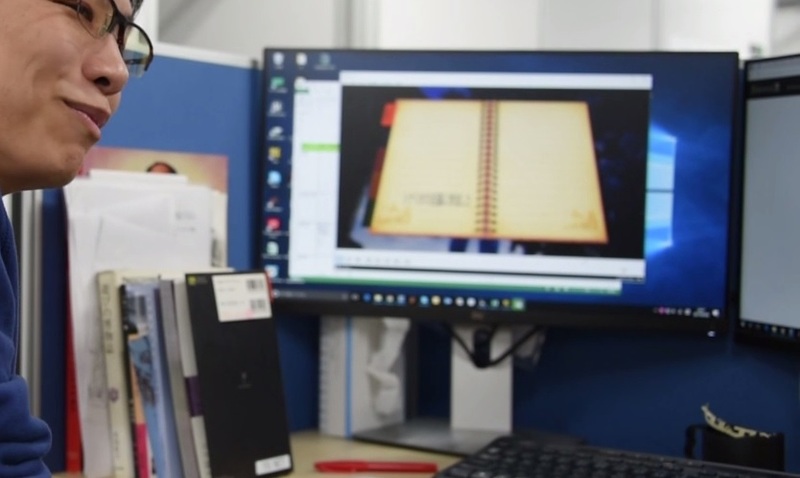 On close inspection it would seem that the notebook has a set of five colored tabs down the left-hand side, suggesting that the new notebook may be divided into several accessible sections. 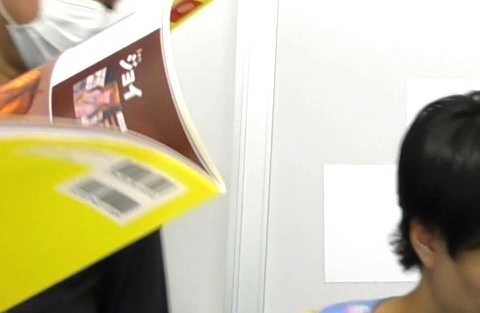 Ryo's new notepad? Tabs can be seen at the left side. The next monitor in the background shows an wide-angle view of what looks to be Bailu village, looking complete and full of incredible detail. 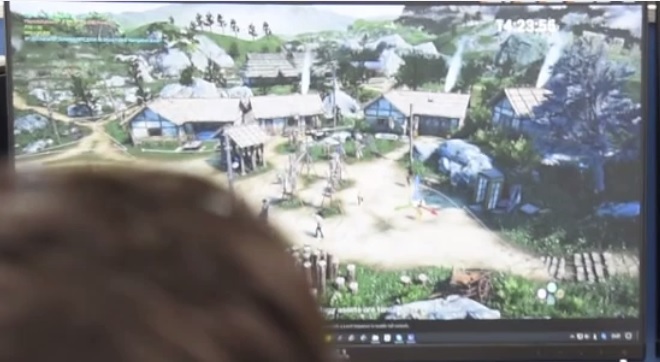 Smoke floats from the chimneys of the houses, and NPCs can even be seen walking across the open dirt area. A wooden cart can be seen in the foreground, and there is a small booth of some kind on the right-hand side - the village phone booth from which Ryo can call people back home? Bailu village: I can't wait to experience walking through it. Although this image is only shown for a few seconds, this is one of the most exciting parts of this update video for me, as it shows the scale of the village Ryo will be able to explore, and brings to life the still screenshots of the village we have seen in the past. 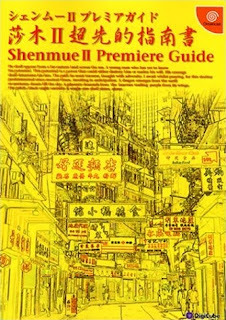 The bright yellow cover of the Japanese-language Shenmue II Premiere Guide book will be instantly recognizable to many. (The person browsing appears to pause at the page about Joy - but I'm sure that's just a coincidence!). 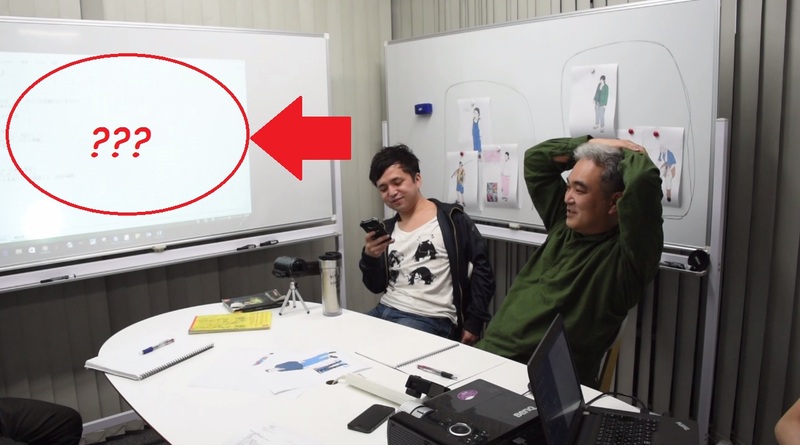 The whiteboard being employed as a projector screen shows some kind of spreadsheet page, with what looks like planning or brainstorming about character interactions - possibly subjects that Ryo can talk about with Shenhua. 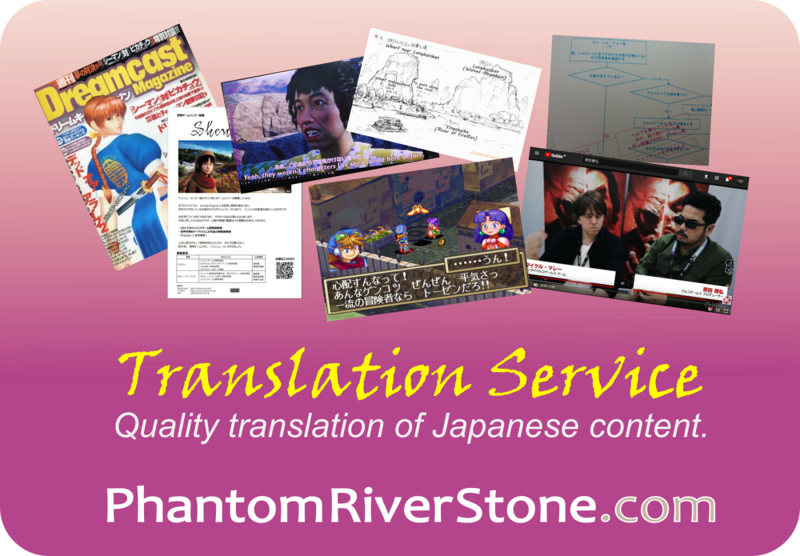 With the help of some contrast adjustment to the image, I was able to pick out and translate a few words on the screen, as marked below. Spoiler Alert! Click to reveal. 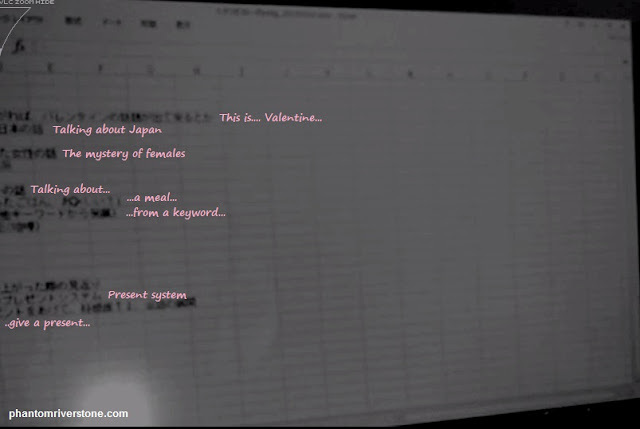 "This is... Valentine...", "Talking about Japan", "The mystery of females", "...a meal...", "...from a keyword..." and, intriguingly, a section that mentions a "Present system" and giving a present. On the whiteboard at the side, and on the table, we also get a nice glimpse of several character illustrations. One of the characters looks to be carrying a fishing rod over his shoulder. The top-right bar has the words "Proto_Shenmue3". Unfortunately, although the screen is shown in close-up, the text at the right-hand side is extremely blurry and I couldn't decipher any useful information. The animations of Ryo opening a cupboard and moves away an overturned chair seem natural and smooth and bode well for animations in general. (The disclaimer in the video states that the character models are tentative placeholders and do not represent the final version). 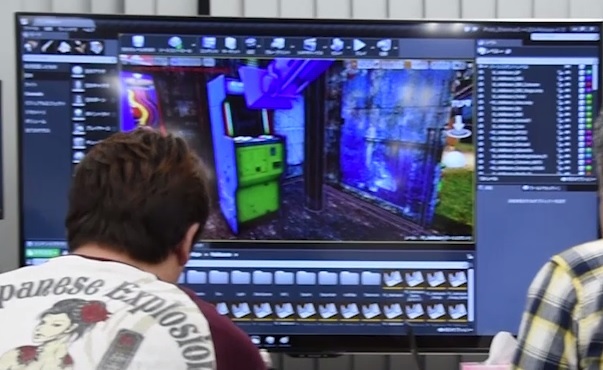 A shot can be seen of the Excite QTE arcade machine from Section One, standing in its surroundings. It appears to be in some kind of old warehouse. 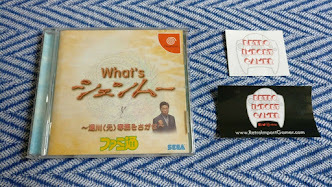 And - what's this? It looks like part of the illustration from a QTE Title cabinet standing next to it also! Let's hope it will also be playable. ...the QTE Title cabinet illustration from the original games. 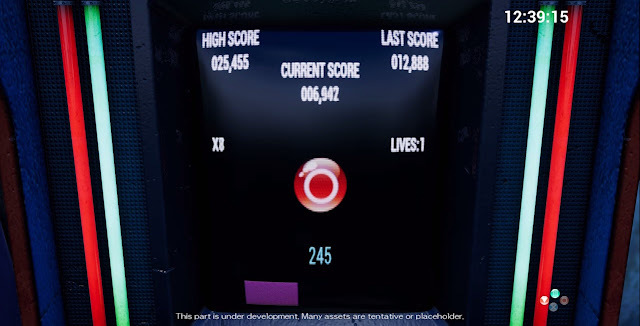 On a few of the brief screenshots of the main game running, a mini-map can be seen at the bottom left of the screens. 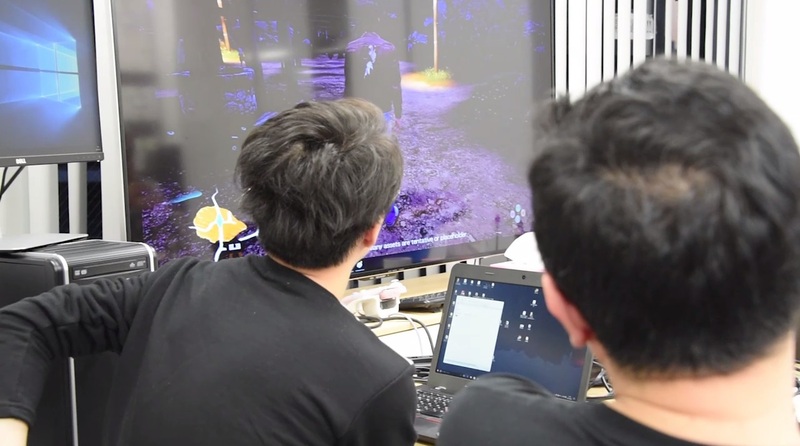 This may be a new feature introduced into Shenmue 3 (although onscreen maps were of course available in Shenmue II if purchased). An onscreen map is present at the bottom-left corner. Although this was a short update, it is clear that good progress is being made on the development front. 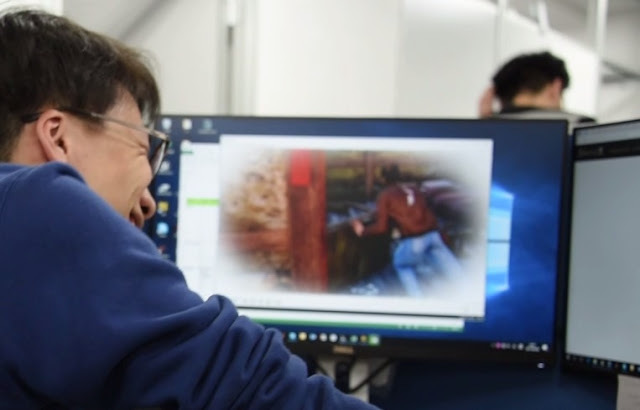 It already feels like a Shenmue game from what has been shown, while some aspects from the older games (such as the notebook) look to be retained and potentially improved. Personally I also enjoyed seeing that the developers are having fun while building the game. 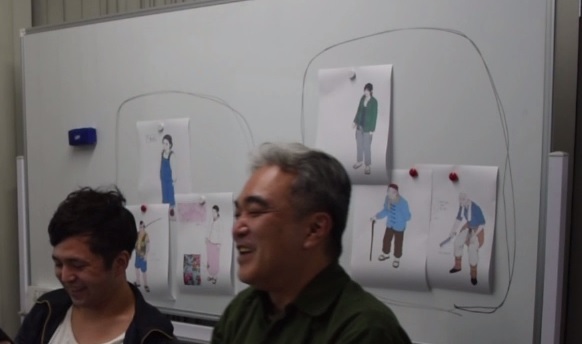 The atmosphere at the meeting with Suzuki-san certainly seems much lighter than the ones from many years ago as seen in the NHK "making of" documentary for the original Shenmue games! I look forward to seeing how character interactions will be handled in a future update. Link to the official Kickstarter update post. I am ecstatic from seeing this footage. I wish Yu-san and his team all the best going forward. This new footage really made my day. I'm looking forward to their next update already! Thanks Robert! I appreciate the feedback. Yes, the concrete progress revealed in this update is very encouraging.